Journey and Santana are teaming up to perform three shows this spring to help launch “Santana IV”, a reunion record featuring members of both bands. Due April 15, the project sees Journey guitarist Neal Schon and keyboardist Gregg Rolie regroup with Carlos Santana and drummer Michael Shrieve. Schon and Rolie were members of Santana before leaving in 1972 to form Journey alongside former Santana manager Herbie Herbert. The two bands will play New York’s Madison Square Garden on April 13, the Mohegan Sun Arena in Uncasville, CT on April 15 and the PPL Center in Allentown, PA on April 16. For the New York City and Uncasville shows, pre-sale tickets for American Express Card Members are available now, while general public seats will go on sale January 29 at livenation.com. For the Allentown show, American Express Card Members can purchase pre-sale tickets starting February 1 at 10 AM local time, with general public seats on sale February 5 at 12 PM at livenation.com. 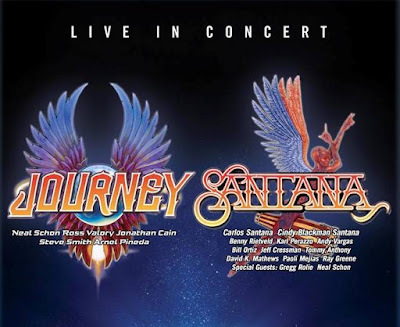 Journey will follow the April series with a North American tour starting in May that will see the band joined by The Doobie Brothers and guest Dave Mason. The 2016 shows will see the return of drummer Steve Smith to the lineup after many years away from the group.